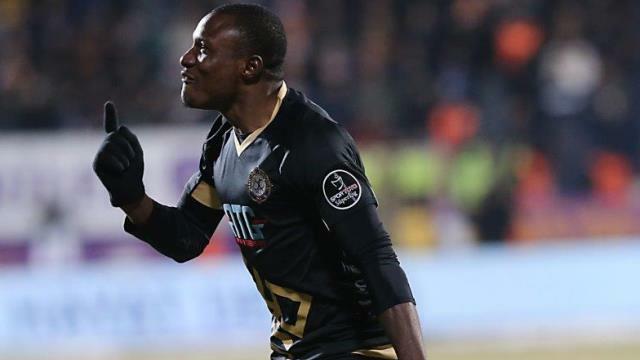 Nigerian striker, Aminu Umar registered his name among scorers for Osmanlispor FK in their 2-0 victory against Romanian side, Steaua Bucuresti in the UEFA Europa League group first game at home in Turkey. Cheick Diabate opened scoring for the home team in the 64th minute, ten minutes after Aminu doubled the lead in the 74th minute; to end the game 2-0 at full time. The Dream Team V1 striker picked up the starting shirt in the game, before making way for Dzon Delarge in the 75th minute, while another Nigerian Raheem Lawal was in action for the entire duration for Osmanlispor. Bucuresti was reduced to 10-men in the 45th minute, when Gabriel Enache was red carded after receiving second yellow in the game. Elsewhere in Portugal, Super Eagles forward, Moses Simon tasted 40 minutes action for KAA Gent in their 1-1 away draw to Sporting Braga. Anderson was in full time action; while Rabiu Ibrahim was an unused substitute for Gent. Both John Ogu and Anthony Nwakaeme were in action for 90 minutes, as Hapoel Beer Sheva recorded 2-0 away victory to Inter Milan at the SanSiro. Earlier in the day, Olanrewaju ‘Larry’ Kayode was 82nd minute substitute as FK Austria Wien defeated Astra Giurgiu 3-2 away from home. Fotrmer Super Eagles striker, Emmanuel Emenike came on in the 73rd minute, as Fenerbahce FC played out a 1-1 draw with Zorya. Ideye featured for 82nd minute in Olympiacos’ 1-0 victory against Young Boys of Switzerland in the away encounter. Midfielder, Nosa Igiebor was in action for the entire duration as his Israeli club, Maccabi Tel Aviv lost 3-4 to Russian side Zenit St. Petersburg in Israel.